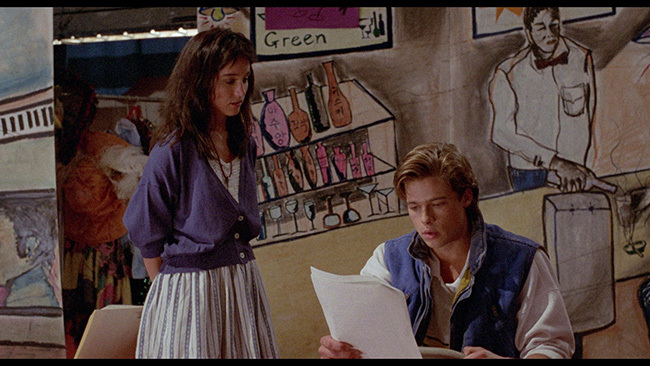 Paula Carson (Jill Schoelen of Popcorn and The Phantom Of The Opera) is a high school student whose fancy-pants District Attorney father, William Carson III (Martin Mull of My Bodyguard and Mr. Mom), decides to go for a solo hunting trip in the woods. Before he splits to get close to nature, he has his daughter assure him she’ll behave – she’s not to have boys over and she’s to go to school every day while he’s gone. She agrees, and off he goes. While at school the next day, she seems more concerned with her dreamy, is stuck up, jock boyfriend Dwight (Brad Pitt of Inglourious Basterds and 12 Monkeys) and unusually flirtatious Brian (Donovan Leitch of The Blob) than she does with her coursework. Brian, however, has more than just a little crush on Jill. He’s recently been let out of a local mental hospital and is suspected of having murdered his own father. 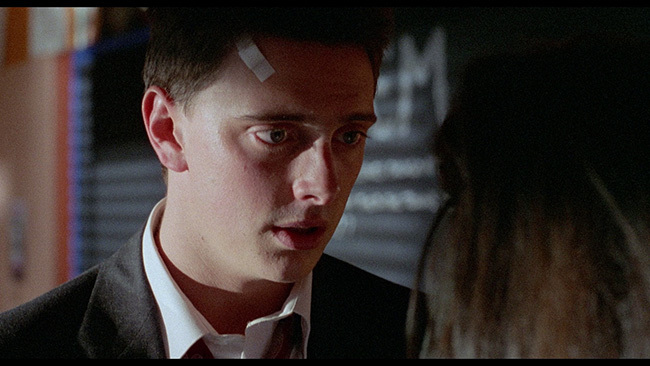 Of course, shortly after Brian’s arrival on the scene, people start getting murdered, leading all involved to wonder if he’s actually been cured or if he still has a penchant for killing. Paula starts to wonder if it’s Brian or if it is Dwight, while William gets shot in the chest with an arrow and has to fend for himself in the woods, fighting for his own survival. 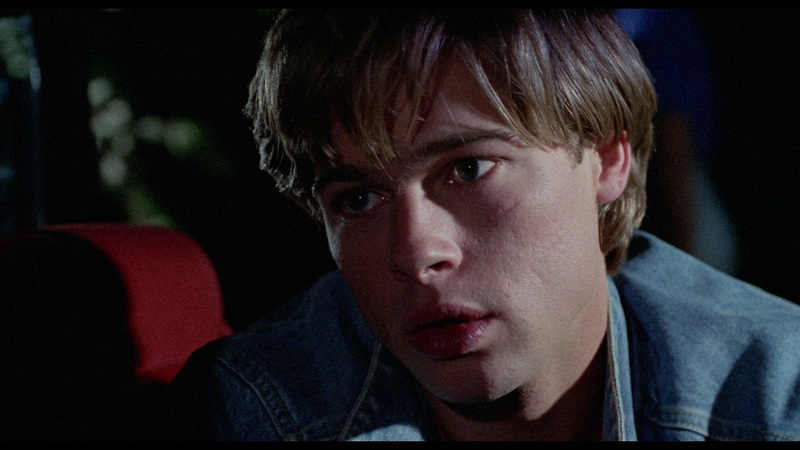 Best known as a John Boorman associate, having worked on Deliverance and written Exorcist II: The Heretic, Excalibur and The Emerald Forest, one and done director Rospo Pallenberg does a pretty decent job with Cutting Class is famous more for the presence of a young Brad Pitt than it is for anything else. The movie is all over the place in terms of tone, it’s sometimes played like a straight slasher film and other times played more parodically. This results in some pretty uneven moments, some of which feel completely out of place, but the overall entertainment value that the picture provides is strong enough to make it succeed. There’s something to be said for the novelty of seeing Pitt in a genuine cinematic oddity like this. 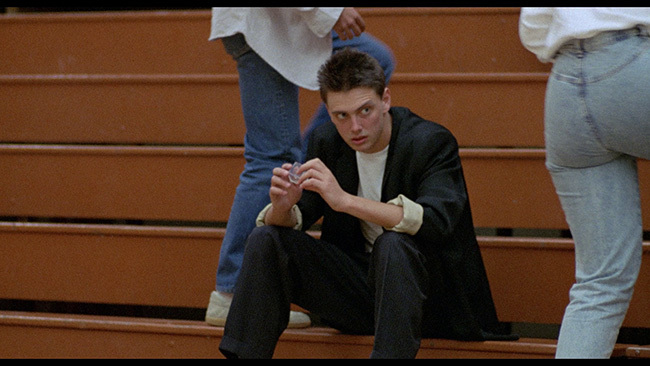 He’s decent in the part, playing the jock basketball star with the right amount of cocky self-assurance. In fact, the whole cast in general here is just… strange. Martin Mull is kind of great in his role as the dad, and hey, check out none other than Roddy McDowell in a supporting role as one of the teachers at Paula’s school. 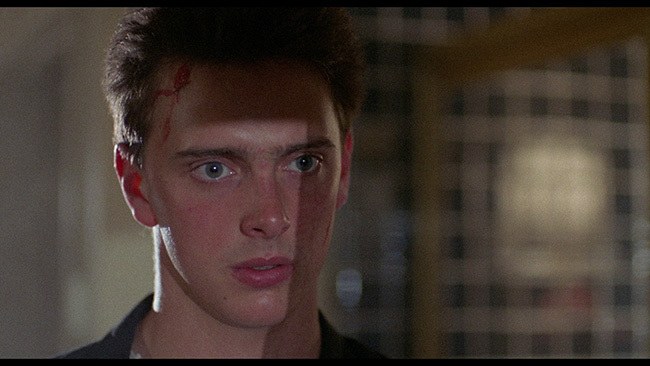 Donovan Leitch, son of the ‘Hurdy Gurdy Man’ singer, does a nice job as the ‘crazy guy’ in the movie while Jill Schoelen, no stranger to horror pictures at this point in her career, is as likeable as ever. 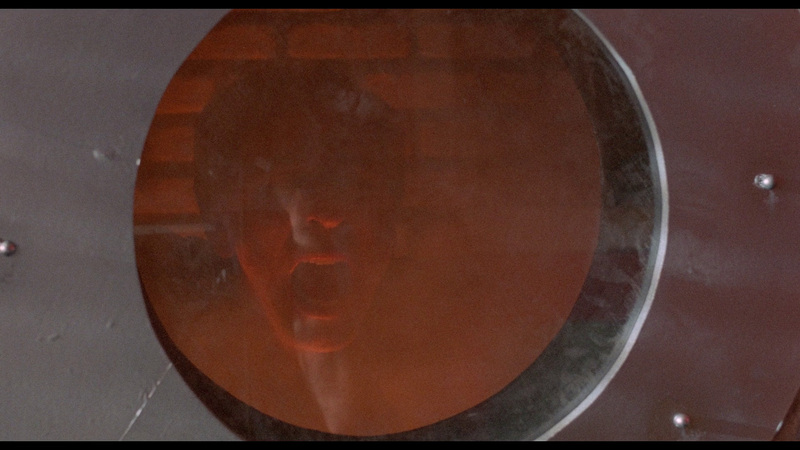 The movie gets bonus points for a few creative kill scenes as well. We won’t go into detail about them here as that would spoil the movie for those yet to see it, but there was clearly some thought put into how to pull these sequences off on camera and they generally work really well. The twist at the end isn’t really a twist at all, a blind man could see it coming, but there are enough genuinely weird surprises tossed in along the way to more than make up for that. This movie might not really know what it wants to be, but at least it knows how to have a good time. 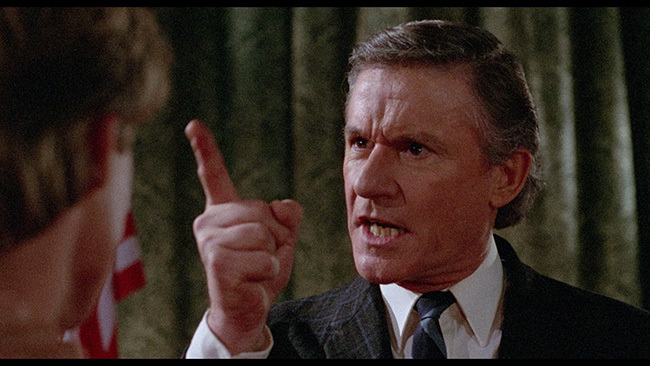 Vinegar Syndrome brings Cutting Class to Blu-ray “Newly scanned and restored in 4k from its 35mm original camera negative” and fully uncut on a 50GB disc in AVC encoded 1080p high definition widescreen and framed at 1.85.1. The picture here is sharp and clean without looking digitally processed. There’s plenty of natural film grain but virtually no print damage at all, the picture is really, really clean. Colors look perfect and black levels are nice and deep as well. There’s no obvious noise reduction nor do there appear to be any compression artifacts. There’s great filmic texture here and the image shows plenty of depth and fine detail – no complaints, this looks fantastic. Extras start off with another commentary track from the guys over at The Hysteria Continues!, one of the most entertaining horror/slasher-movie-centric podcasts out there. If you’re familiar with their approach, you’ll know what to expect here – a lively conversation about the film and plenty of discussion and opinion on what works and what doesn’t. There’s some amusing discussion about the more dated aspects of the movie (let’s face it, this one is firmly rooted in the eighties, there’s no way around that) as well as some of the quirks inherent in the script. They also talk up the performances, some of the more memorable kills, the direction and more. It’s an entertaining mix of facts/trivia and opinion related to the film. 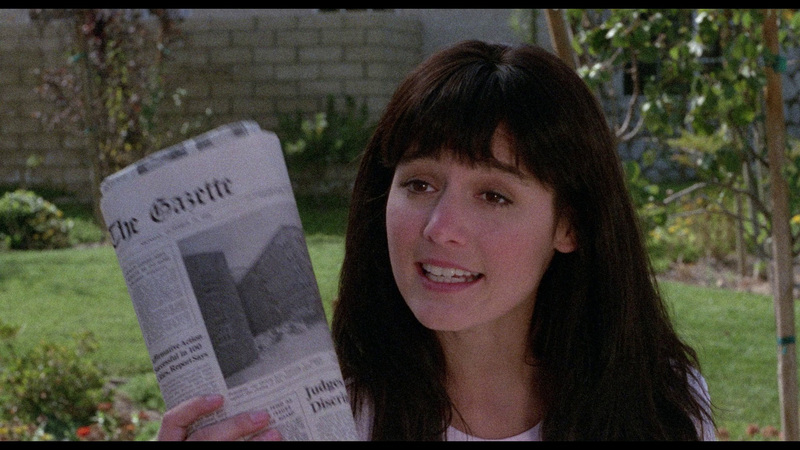 From there we move on to a video interview with lead actress Jill Schoelen called Un-Cutting Class. Here, over the span of twenty-one-minutes, Ms. Schoelen talks about how she initially didn’t want to do the picture as well as how and why she came around, her thoughts on working with Pallenberg, issues that she had with the script and the overall quality of the film and more. A second interview, Donovan Makes The Cut, interviews Donovan Leitch for sixteen-minutes. Here he speaks about getting his part in the film, how the movie ties into Deliverance of all films, how he got along with the cast and crew, including Pitt, how budgetary restraints affected the movie and more. Vinegar Syndrome also includes two audio interviews, the first of which is with Pallenberg and runs just over forty-six-minutes. Here he talks about his background, how he got into the film business, what he’s done outside the film business, his relationship with John Booman, how he wound up directing Cutting Class and what his experiences doing that were like. The second interview is with director of photography Avi Karpick and it runs just short of twenty-four-minutes. He speaks about his background, how he wound up getting work on Cutting Class, what it was like on set, collaborating with different cast and crew members and more. The audio is pretty rough on this one but the content is good. It’s also interesting to see the alternate shots from the MPAA approved R-rated version of the film included here. This is done with a four-minute split-screen comparison that shows what was trimmed, it’s interesting stuff. The film’s original theatrical trailer, menus and chapter selection options round out the extras on the disc. Cutting Class is uneven and goofy but so too is it a lot of fun. The cast alone is reason enough to check this out but some solid murder set pieces up the ante enough that, for slasher fans, this is a pretty easy recommendation. The fact that the movie looks and sounds as good as it does here also helps and a solid array of extras is the icing on the cake! Click on the images below for full sized Cutting-Class Blu-ray screen caps!